The Opticon OPR3101 has reached end of life. It has been replaced by the Honeywell 3820. The Opticon OPR3101 barcode scanner gives any light industrial or retail location a durable and efficient means to capture data. The built-in Bluetooth 2 radio allows the OPR3101 to communicate from up to 35 feet away, and if the signal is lost, the barcode scanner will store scanned data until it gets back into range. Ideal for rough retail or light industrial applications, the OPR3101 features an IP54 seal to protect it from dust and water. Rubber overmolding protects the barcode scanner from drops of 6.5 feet to concrete, and a trigger guard keeps your knuckles safe from accidental collisions with inventory. 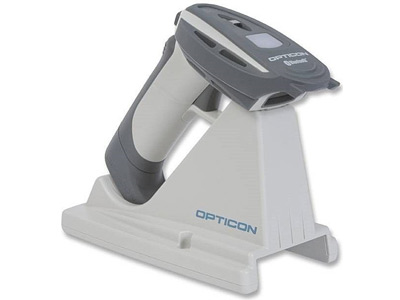 This unique design makes the Opticon OPR3101 barcode scanner a smart choice for any rough environment. Find it faster! Click here to compare OPR3101 models by feature.